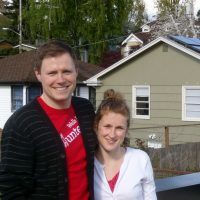 We have led or trained managers of 18 Solarize campaigns across Washington and Oregon, galvanizing over 900 homeowners to install solar and unleashing $18.7 million in local economic activity. To date, our Solarize Northwest program has resulted in over 4.5 MW of installed solar. Above: Solarize Snoqualmie project partners share the ingredients for a successful Solarize campaign after winning the AWC Municipal Excellence Award. The following is a menu of Solarize support services that we can provide to communities that wish to lead a Solarize campaign. These services are meant to support, not supplant, the role of Campaign Manager, which would be filled by a local government staff person or volunteer. We will guide and support the grassroots outreach and education effort by the campaign manager. Facilitate initial Outreach Committee meeting; determine volunteer roles and share proven outreach activities; develop outreach calendar. Create and sign a tailored MOU between Northwest SEED and selected installer(s) specifying the solar installation offering, customer service expectations, and campaign roles. We are happy to work with project organizers to develop a customized support package specific to your needs. Please contact our Program Director, Linda Irvine. Linda@nwseed.org 206-267-2215.